First of all, I want to thank the Backyard Bird Nerd for her amazingly tight, crisp photos of the rose-breasted grosbeak. These photos beg anyone who’s interested in bird art to grab a pencil or brush. They are incredible shots, every one of them! I may feature these photos all week, since we’re celebrating birds on Friday, and there are so many great photos to choose from here. She captures these birds in the cutest poses, too! I encourage you to take a look at them. In preparation for this month’s version of Draw a Bird Day on the eighth, I decided to show an abbreviated version of my process for approaching a bird drawing. I learned this from watching YouTube videos of The Frugal Crafter and from reading this book at the end of last year; I am by no means an expert. I could draw nothing in September, 2014. People I know still can’t believe I can draw. Honestly, I am the most surprised of anyone. I think it comes down to a real interest and diligent practice. This means if I can do it, so can anyone else. 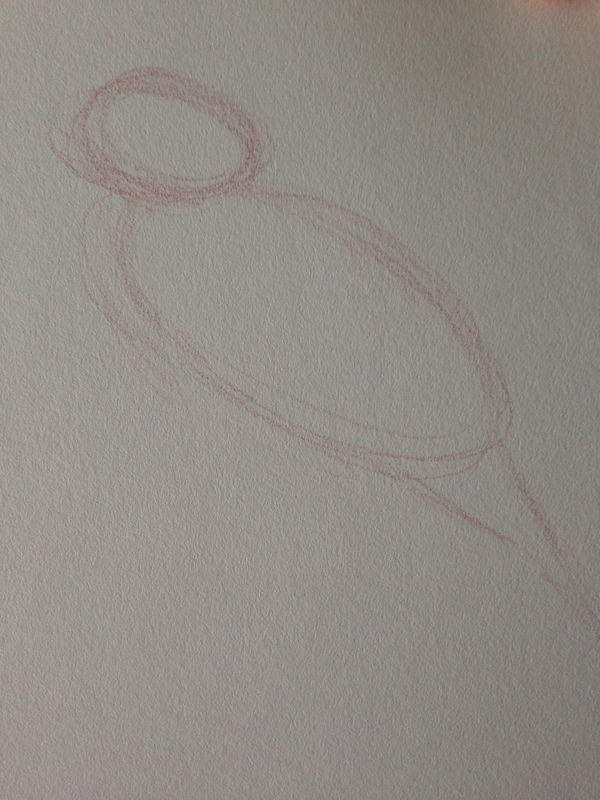 Step One: The first thing I try to do is get a feel for the angle and shape of the bird’s head and body. Think of the bird in a few basic shapes. Keep it simple. The head is roughly the shape of a grape or a football, the body is usually an egg-shape. The tail may be different shapes, depending upon your angle to the bird, but the important thing to keep in mind really is the angle of the tail in relationship to the body. I’ve roughed in my head, body and tail here. Don’t be afraid to go over the shapes lightly with your pencil again and again, until you feel like you have them placed about right. Step Two: Once the head, body, and angle of the tail are placed, it’s time to begin to define the shapes a bit. 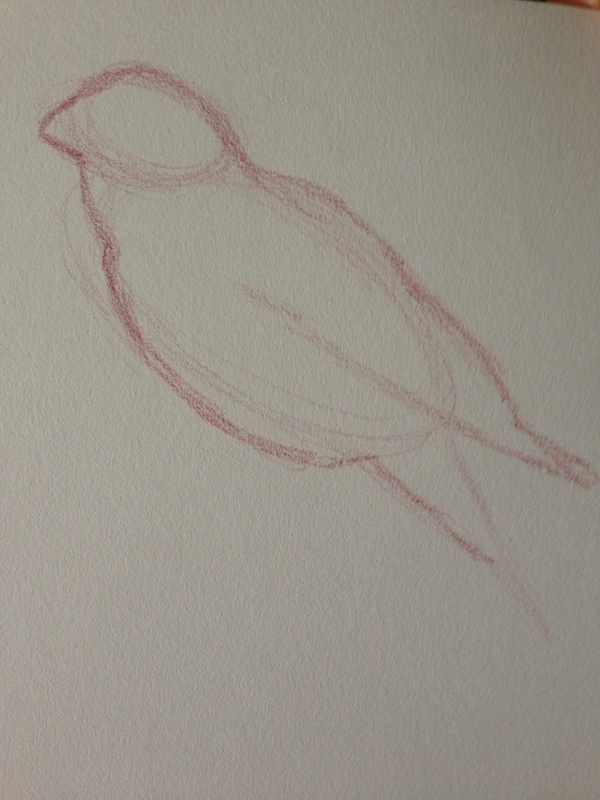 I’m focusing on creating an outline of the bird’s entire figure at this point, including the wing(s), of course. Step Three: Once you feel you have a good approximation of the outline of the bird, turn to the inside. Sketch out areas of any color change, draw in the eye and beak details, and sketch in the legs and feet. At this point, there will invariably be stray lines or areas where the drawing has gone a bit awry, and now’s the time to make those corrections. I don’t usually add the perch until I have an idea where the feet are going to be. That comes in last. I hope you’ve found this post helpful. Keep tuning in for more bird drawing “lessons” this week! Let’s make WordPress fly this Friday, May 8! Peace and Happy Monday to you. Love the tutorial! 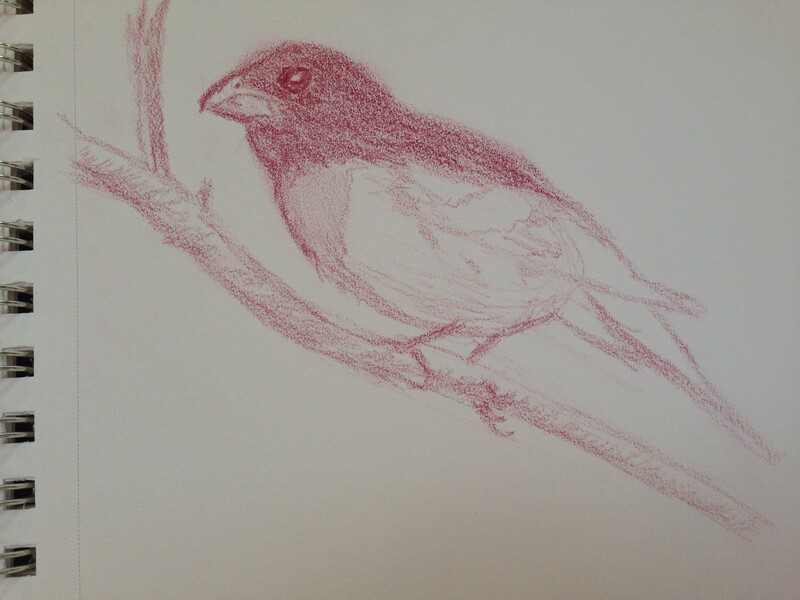 And you nailed the rose-breasted grosbeak – the shape of the beak and the eye! We have them at our feeders, and I would have been able to identify it without knowing. Isn’t it amazing that you can start with those simple shapes and end with this! I am even beginning to believe I’m going to be able to do this! 🙂 I am going to check out that paint my photo site. I’ve been meaning to. Great post, Laura! Happy Monday! That made me smile! Well done! That’s helpful! Thank you. I like your outcome. I’m glad, Kirk. Thank you! Hi Laura – I like your approach, thanks for the tutorial tips and I’ll look forward to seeing your finished drawing. There are so many birds to draw! Amen, Sharon! I did four birds yesterday. This one was my least favorite, but it was the only one I took the time to do in step-by-step format. I’m so glad you enjoyed them, Jill! I just followed a bunch of people she follows because most of them are wildlife/birding photographers. And so many of them get those amazing shots I’m looking for for painting/drawing. I think I prefer working with wildlife subjects. I would like to get into landscapes too, but it feels tooo…..much for me right now. Although I’d love to be able to do it. Do you ever do landscape work? I’d love to do skyscapes and seascapes! L, thanks for posting this. It’s very helpful. Yesterday, I brought my first set of Derwent Inktense as I’ve been experimenting more and more with Zentangles and watercolor. I hope to explore more and get into some wildlife drawings though. I’ve started practicing how to draw koi and a simple owl (I plan on tangling him). I’ll be adding this bird tutorial to my list. I’m thinking of starting an Instagram acct to keep myself accountable. Much less work than a blog. I should also add…THANK YOU for the inspiration. Without you talking about art and it’s benefits I don’t think I would have thought about it or started on the Zentangle journey, which seems to be taking me in other directions. So, thank you! That is so cool! This is why I mention Lindsay, The Frugal Crafter so much, because without her, I would have never thought it was possible. Art was always something that was “too good” for me, something I tried and failed at and didn’t want to fail anymore. Now I see it totally differently. I’m so glad that I could do the same for you. That really makes my day! And you really are taking the ball and running with it! I’m so proud of you! Thank you, I’m glad it spoke to you. I sometimes wonder whether I have any right to post lessons of any type, being such a newbie at this art thing. I’m happy some have gained something from it. The illustration was great, as were the tips! Also, your enthusiasm is contagious!!!! Aww thanks, Teresa, you just made my night. Aw, thank you! I’m so glad you got something out of it!